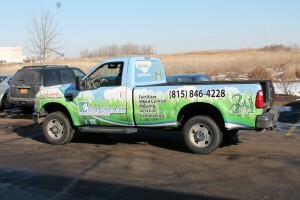 How Landscapers Advertise with Truck Graphics in Joliet iL! Great Greens is a lawn maintenance company that serves residential and commercial clients. Beyond the customary mowing and edging, this company stands out by its vast menu of specialty services. Aeration, de-thatching, over-seeding, fertilizing and mulching are just a few of the gardening tasks that Great Greens offers to its clients. When it came time to effectively brand and market its business concepts using the work truck, the company’s management contacted Mark Your Space. We talked with the company’s representatives and looked over the art work and graphics that currently identify the brand. 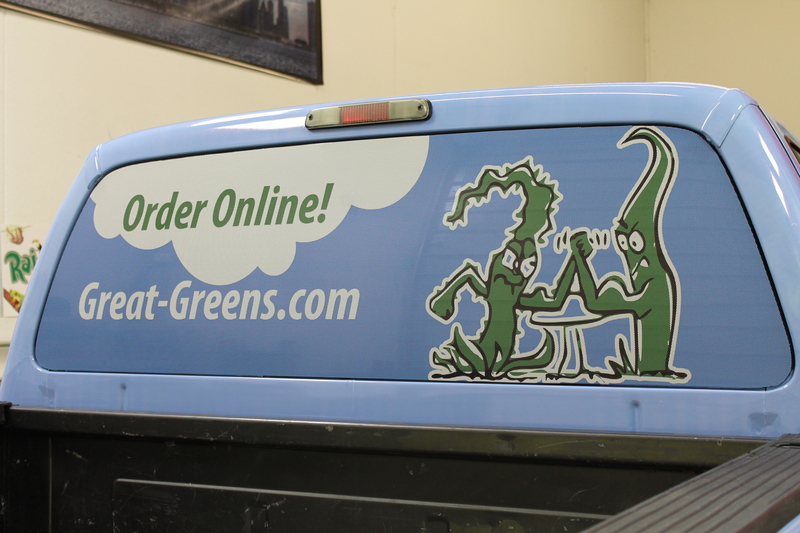 Translating them into truck graphics for Joliet, IL, branding purposes was easy! We designed and installed a full truck wrap as well as a window perf. The wrap identifies the company and its contact information as well as the most popular services on the menu at this time. Company name and logo. Forget the bland work truck. 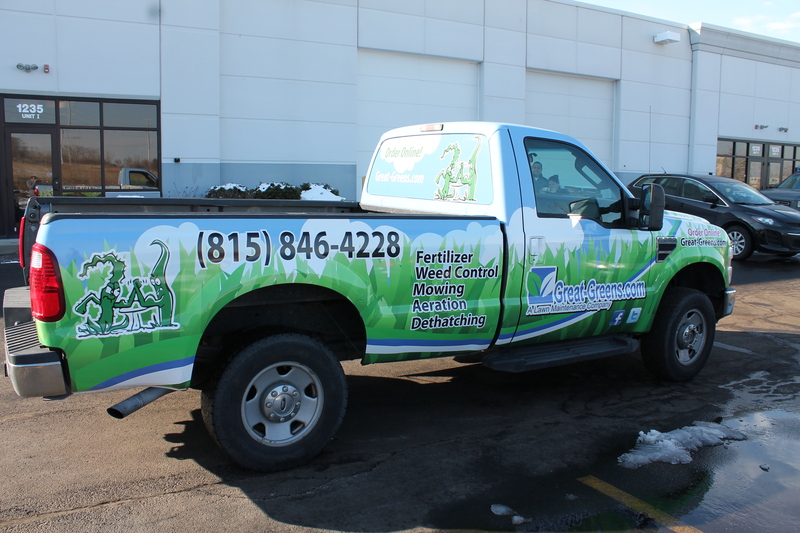 When we install full truck wraps for Joliet, IL, businesses, we add memorable niche-specific graphics that serve as the perfect backdrop for a clearly visible company name and logo display. Everyone will come to associate the look of your work truck with your company name. Contact information. We make it easy for your customers to find you. Whether you run a landscaping business or any other type of contracting company, we ensure that prospective customers can find you online, contact you via phone and get a hold of you via any other means of communication that you choose. Social media information. Do you love to discuss mulching and weed control with your Facebook page members? Add the social media platform icon to the wrap. This ensures that your current and potential clients know that there is always an open door when they want to talk business with you. Specialty services and locations. Let consumers know what your specialties are. Even if you offer some of the same services as the competition, consider that it may be the collection of spelled out specialties that persuades a consumer to choose you over the other company. The same is true for locations or areas that you serve. Name these neighborhoods and areas on your wrap to encourage calls from these cities. Adding a window perforation (perf) is a great way to include some additional marketing space. While you can safely look out of your vehicle, motorists see your ad information. Since we usually use lighter colors on the perf for a popping display, these are real attention getters and well worth the inclusion into the whole wrap. Title: Lawn Maintenance Company Advertises with Truck Graphics in Joliet IL!